A new dissolve effect will now play when an after mining efforts deplete all mineral resources from an asteroid. Upgrades within the Seeker Investigation has been redesigned to be easier to understand, and so that it no longer relies on the redeem queue. Ship scanning a Strategic Cruiser will now list its fitted subsystems. Added an extra warning when offlining the last structure service module, which would put the structure into "low power" mode. It is now no longer possible to re-dock at an Upwell structure in high sec while having a criminal timer and flying any ship (except a capsule). This is now behaving the same way as for stations. Modified attributes in show info windows that cannot be accurately determined to be positively or negatively affected are now colored yellow. Added a shortcut for "Open Ship Maintenance Bay". Saved location folders can no longer be created with identical names. Kill mails where a structure is the attacker will now include the structure owner's alliance. Previously only the corporation was included. Activity Tracker can now be opened in a windowed mode. Fixed an issue with the Preview window display. Search history now visible in the EVE Search if you press backspace when the input box is already empty. Fixed an issue with the removal of bookmarks. Clicking the 'Bill Issued' notification now opens the approriate tab in the Corporation wallet. Fixed an issue where the Look At command was not working correctly for signatures and anomalies. Fixed an issue with the Search input in the Map. Fixed an issue where selecting Show on Map in the Show Info window of a Corporation would display incorrect results. Fixed an issue where the map lines were too dim. Renamed the 'My Colonies' Map filter to 'My Planetary Production Colonies' for clarity. Inactive client muting will not deactivate sound for new game sessions. Removed the variations tab connection between the Dragonfly and Gecko. Fixed kill reports not generating when ships are destroyed by sentry guns. Fixed an issue where wormholes would sometimes not correctly expire over downtime. This could lead to static wormhole's reappearing at the same location as the previous one, or wormholes that lead to different locations in different directions. Changed the name of the 'Absolute' booster to better reflect its expired status. Brainfreeze Cerebral Accelerator contracts can now be searched for. Fixed the input materials for the Frostline 'Clavicula' Integrated Analyzer module so that it requires both a data analyzer and a relic analyzer. Corrected the year number in the Yoiul Festival YC121 SKIN banners. Adjusted the scenery in Hierarchy combat sites to reduce performance impact. Fixed a minor sound defect on the Sansha Fighter Shadow. Fixed an issue that caused the tether graphical effect to disappear a few km before the tether effect is removed. Addressed an issue where visuals for Triglavian Modules were not appearing. Fixed an issue where ships would sometimes not exit warp correctly and would instantly appear on grid. Fixed an issue where ship would appear to jump through acceleration gates instead of warping. Adjusted missile graphic behavior to minimize errant missile paths and explosions. Fixed an issue whereby cloud harvesting VFX from the turret would be aimed at the player's ship. Changed "Ship Ambiance" to "Ship Ambience" in the Audio Menu Settings. Fixed an issue that could result in searching the market without any parameters leading to having to close and reopen the market window. The Sunesis blueprint can now be searched in contracts. Added a note to the description of the Industrial Core modules to indicate that its effects are subject to diminishing returns when paired with other modules affecting the same attributes. Being tethered to an Upwell Structure will no longer prevent an Interdictor from activating Interdiction Sphere Launchers. Once launched, the bubble will prevent the ship from being re-tethered until it expires. Corrected the meta level of the Standup XL Energy Neutralizer II. Added repackaged volume to the capital tractor beam modules. Added a correct packaged volume to the Industrial Core II module. Removed input materials from copying, TE and ME jobs for the Standup XL-Set Laboratory Optimization I Blueprint. Added a link to Spectre Fleet Alliance in the description of the Spectre Fleet modified entosis link. Clarified the description of the electronic superiority command burst charge to list the module groups it affects. Set the "capacity" attribute to 0 for all Capacitor Booster Charges to avoid confusion. Corrected the launcher group attribute on XL cruise missiles. Fixed an issue where some users were not receiving skill rewards from the Seeker Investigation. Several objects were moved in the Independence Combat Anomaly so that the NPCs will no longer be blocked or spawn inside objects. Museum Arcana NPC bounties have been reduced. Objects in the Worlds Collide mission have been moved slightly to make sure players and enemies are less likely to become stuck. Various typos have been fixed in Combat Site messages. 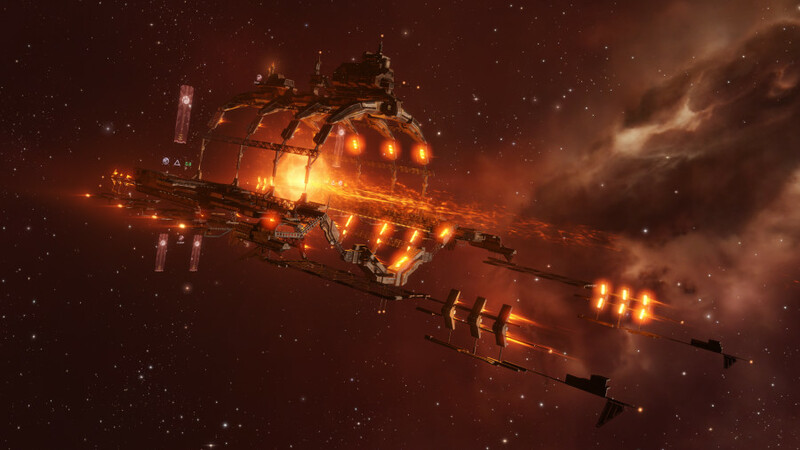 Sansha's Nation attempted to expand its borders into the the Serpentis Drug Outlet deadspace complex, but the Guardian Angels caught them and put a stop to it. The errant Sansha NPCs in the Serpentis Drug Outlet have been replaced by the correct Serpentis NPCs. Ancient relics can now be repackaged and resold if they get unpackaged by a failed attempt to start an invention job. Stations in Thera will now correctly respect standings from The Sanctuary when calculating reprocessing taxes. Set the volume of the ascendancy implant blueprints to 0.01 m3 to match other blueprints. The show info window is now showing the corpse hold capacity for the Blood Raider capital ships. Corrected the value of the stance switching time for Tactical Destroyers when shown in the Compare Tool. It is no longer possible to launch unassembled T3 cruisers into space. Removed the "Unload to Cargohold" option from loaded charges in a module fitted to the Monitor, and replaced it with the more appropriate "Unload to Ammo Hold"
Corrected the drone mining bonus on the Arbitrator to remove its impact on ice harvesting drones. Fixed an issue that caused Booster Bays and Corpse Bays to not appear correctly in the show-info window attributes tab of ships. Fixed an sporadic issue with training of skills while logging in. The client was sometimes still using the old skills, which could lead to wrong values in the fitting window or could block starting industry jobs due to a mismatch in the calculated duration of jobs between client and server. Updated the attribute descriptions used by the Bomb Deployment skill to make it clearer that the skill reduces bomb launcher reactivation delays. Fixed a problem where the autopilot would not correctly warp to a structure if it was still anchoring or if the pilot lacked docking access. Added a note about decay times to the descriptions of mobile warp disruptors. Fixed an issue that would cause an Upwell Structures timer to not show after warping on to its grid. Transferring ownership of an Upwell structure now correctly kicks any controlling pilot and deactivates any active modules. Renaming an Upwell Structure now correctly requires the Station Manager or Director role. The Draccous faction Fortizar now correctly applies its fuel consumption bonus to all engineering service modules. Adding an extra character to the dynamic part of Entosis Command Node names to reduce the chances of duplicates. Names will now be of the form AB12 (previously were A12). Green Safety settings no longer prevent the attacking of an Upwell Structure of a war target's corporation or alliance, immediately after joining an alliance. Fixed a bug that items in the corp delivery hangar in Upwell structures did not show in the contract creation window. It is now possible to copy contracts for items, which are located in the corp delivery hangar of Upwell structures. Fixed an issue that prevented moving ammo between fitted weapons. Fixed an issue where charges could get stuck in an empty fitting slot if the module was removed while charges were being loaded. Fixed an issue with remapping solar systems that would sometimes lead to broken/duplicate entosis command nodes spawns. Fixed a client performance problem, which happened when delivering many industry jobs in one go. Fixes have been made to make New Eden a safer place. Various text, grammar and punctuation fixes. The Show Info window for Courier Packages (Freight Container) will now display correctly. Places folder windows are now refreshed as expected even when the places tab is not visible (when adding/removing locations, or when jumping between systems for example). Duel Invite dialog no longer opens with exclusive focus, and there is now a Confirmation dialog step to properly accepting a duel. Slightly increased the opacity of selected window tab to more clearly show which one is currently selected. Improved the display of some corporation member management tabs, if no data was found with the current filter. Fixed overlapped options in the contract search window. Compare Tool: The width of the attribute filter pane can now be increased a bit further to be able to read the full description of attributes. Compare tool: Fixed a minor display issue with some attributes. Fixed a minor overlap between the duration text and the show info icon for boosters in the augmentations tab of the character sheet. Reformatted the "Legality" tab in the show info window for illegal items and for factions, so that the text can be read properly without overlapping or being cut off. Fixed the dragging of Landmark's images from their show info window so that they have a correct text and image. Fixed a missing text string in the ESC – shortcuts menu. Improved the drag & drop behavior of search results, when searching for recipients for a new mail message. Jettisoning a corpse no longer displays an inaccurate error message. Window shown when selecting "View Contents" on a ship now correctly named "Items in Ship"
Corrected the names of various "Edit Shortcut" windows. Fixed an issue where a fleet setup wouldn't load correctly if its name contained capital letters. EVE Mail: Reduced the max size of the reading pane slightly to ensure that it can never completely obscure the list of mails. EVE Mail: Character limit can no longer be surpassed by dragging a link into the message box after the limit has been reached. Removed the long defunct Sovereignty Blockade Unit group from the Overview Settings. Fixed an issue that caused inaccessible structures to briefly appear on the overview when undocking. Added a display of the character limit for the description of bookmarks (This limit already existed but was just not shown). Fixed an issue that would cause the menu not to appear when right clicking on an Ansiblex Jump gate in a ships cargo. To avoid unnecessary confusion, the loading bar shown when cancelling an insurance attempt on an already insured ship displays "processing" instead of "cancelling". Improved the clarity of the warning message provided when boarding a strategic cruiser. The descriptions of several upgraded ore variants have been updated to clearly state how much of an improvement they are over their standard cousins. Clarified the error message provided when attempting to activate a module on a target in the wrong inventory group. Fixed an issue that would cause significant FPS drops while typing long mails/notes. Fixed a missing text string for the "Structure Transfers" option in the corporation window for members without director roles. The Factional Warfare Progress bar no longer flashes after the system is lost. Updated the info panel so that missions that were previously showing the text "Read mission journal for details" now display "Read Details" with an option to click to open the Details window. Fixed an issue where directional scanning distances were not currently updated upon exit of pilots who had previously been on the same grid. I do not even know the way I ended up right here, but I thought this publish was once good. I don’t realize who you might be but certainly you are going to a well-known blogger in case you aren’t already 😉 Cheers! I loved up to you will obtain performed right here. The cartoon is tasteful, your authored material stylish. nevertheless, you command get bought an shakiness over that you wish be delivering the following. in poor health for sure come further earlier again as exactly the similar nearly a lot ceaselessly within case you defend this hike. Do you mind if I quote a few of your posts as long as I provide credit and sources back to your webpage? My blog site is in the exact same area of interest as yours and my visitors would genuinely benefit from a lot of the information you present here. Please let me know if this okay with you. Many thanks! Aw, this was a very nice post. In concept I wish to put in writing like this moreover – taking time and actual effort to make an excellent article… however what can I say… I procrastinate alot and in no way seem to get something done. I am looking both for blog sites that give impartial, well balanced discourse on all concerns or blog sites that have a liberal or left-wing angle. Thank you. You should take part in a contest for one of the greatest sites on the web. I’m going to recommend this blog!